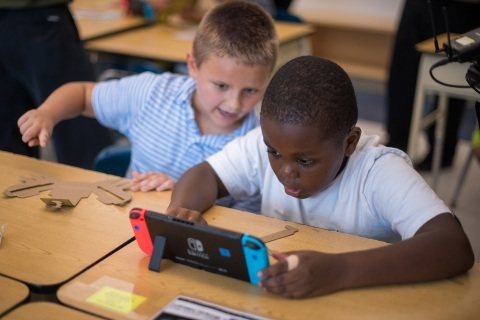 In this photo provided by Nintendo of America, third-grade students at the Douglass G Grafflin School in Chappaqua, New York, participate in an interactive learning session with the Nintendo Labo: Variety Kit for the Nintendo Switch system, led by Rebecca Rufo-Tepper, Co-Executive Director of the Institute of Play. On Oct. 23, Nintendo and the Institute of Play announced a partnership to bring Nintendo Labo kits into elementary classrooms nationwide. The program combines the innovative play of Nintendo Labo with the basic principles of science, technology, engineering, art and mathematics (STEAM) to inspire kids and help make learning fun. In this photo provided by Nintendo of America, third-grade students at the Lake Hiawatha Elementary School in Lake Hiawatha, New Jersey participate in an interactive learning session with the Nintendo Labo: Variety Kit for the Nintendo Switch system, led by Shula Ehrlich, Creative Design Lead at the Institute of Play. On Oct. 23, Nintendo and the Institute of Play announced a partnership to bring Nintendo Labo kits into elementary classrooms nationwide. The program combines the innovative play of Nintendo Labo with the basic principles of science, technology, engineering, art and mathematics (STEAM) to inspire kids and help make learning fun. In this photo provided by Nintendo of America, third-grade students at the Lake Hiawatha Elementary School in Lake Hiawatha, New Jersey, participate in an interactive learning session with the Nintendo Labo: Variety Kit for the Nintendo Switch system. On Oct. 23, Nintendo and the Institute of Play announced a partnership to bring Nintendo Labo kits into elementary classrooms nationwide. The program combines the innovative play of Nintendo Labo with the basic principles of science, technology, engineering, art and mathematics (STEAM) to inspire kids and help make learning fun. 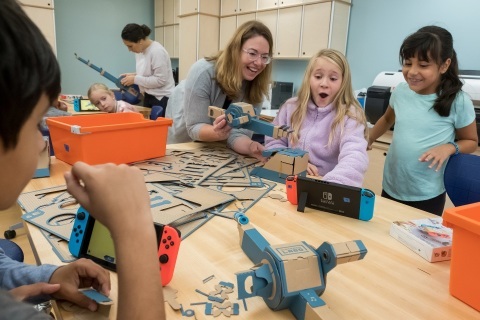 REDMOND, Wash.--(BUSINESS WIRE)--Nintendo and the Institute of Play have teamed up to bring Nintendo Labo kits into elementary classrooms nationwide, combining the innovative play of Nintendo Labo with the basic principles of science, technology, engineering, art and mathematics (STEAM) to inspire kids and help make learning fun. Nintendo will provide Nintendo Labo: Variety Kits and Nintendo Switch systems to participating classrooms to reinforce skills such as communication, creativity and critical thinking. The program aims to reach approximately 2,000 students ages 8 to 11 during the 2018-2019 school year. About Institute of Play: Founded in 2007, Institute of Play is an education-focused, non-profit design studio focused on creating experiences that make learning irresistible. The Institute’s goal is to create a paradigm shift where instead of making students learn, teachers nurture students’ 21st Century skills and innate creativity, inspiring them to learn. Through our programs and partnerships we have been developing a diverse learning community of educators who feel empowered to collaborate, problem-solve, and innovate across sites. Our first success was the design and implementation of an innovative NYC public school, Quest to Learn, which opened in 2009 and now offers a complete 6-12th grade education. Over the past four years, we have developed many different programs designed to build upon the success of Quest to Learn by using the Quest Learning Model, which research has shown positively impacts student development of 21st Century skills. Though we have international reach, IOP primarily works with New York City and tri-state area schools. Institute of Play is part of a growing movement to transform education through play. By focusing on play, we believe that we can shift the way schools work, teachers teach, and create a learning revolution. Note to editors: Nintendo press materials are available at https://press.nintendo.com/, a password-protected site. To obtain a login, please register on the site. Nintendo and the Institute of Play have teamed up to bring Nintendo Labo kits into elementary classrooms nationwide.